I’m a huge LOTR/Hobbit fan. I do the same thing when I read where the characters are. I refer to the map, even though I’ve read the series a dozen times or more. I love being in that world. I know what you mean. I recently read a book where the author included a map, but then had the main character travel to a place… that wasn’t on the map!! I didn’t understand it. I had a general idea of where that locale might be, but it left me feeling very unsatisfied because I wanted to know without a doubt. Amazing how much angst and anxiety it caused me, hah! You would think a writer would carefully inspect even the smallest details. Then again, not many writers are Tolkien caliber. 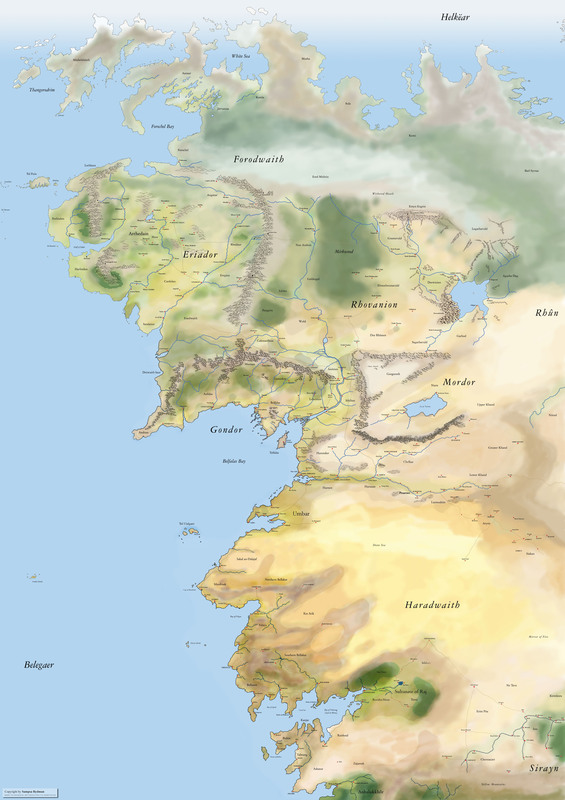 Maps are incredibly important to me, especially in fantasy novels. 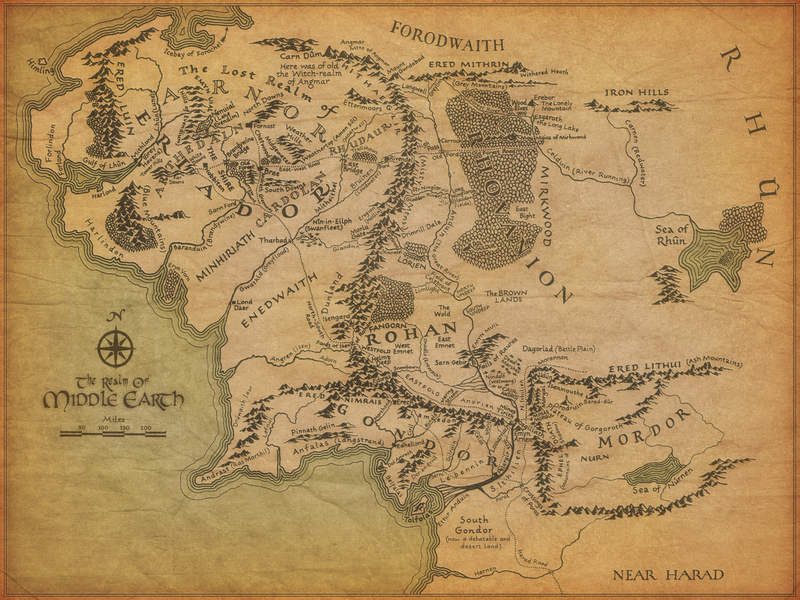 LOTR was not the first ‘fantasy map’ I saw, in fact, but it is certainly up there with the best of them, however, Tolkien included only those areas that appeared in his work, and he was writing Earth in time before recorded history, which means there is a whole world to explore. Sites like Lindëfirion have created maps for the whole of Arda, and maps of certain cities/areas, which are wonderful. When I began writing fantasy, I always drew a map first. It was rough, just in pencil but luckily, surrounded by teachers, I knew enough about geography, geology, climate, the effects of mountain ranges or oceans on climate etc, to really think about the world I was writing. (If I didn’t know, I referred to books, atlas’ or asked) Where did people live, had they settled somewhere because it was on a river, had a good natural harbour, a climate suitable for growing certain crops. Was their wool excellent, such as came from parts of England in the Middle-ages. if it was desert, their cities must be situated near natural oases; were they nomadic and why? Who traded with whom, and what did they trade? Silver and amber and furs perhaps from the north, and wine, spices etc up from more southerly lands. If there were wars what would be the economic effect? I thought of all that when drawing the maps, (still have some old ones around stuck in tatty buff folders) and they gave me a ‘gods’ view of the world, making it real, somewhere I could write in because I had made it. I am always very disappointed when I find a fantasy book with no map. It’s not really that hard. It also makes the world more real if the writer knows a bit about the climate zones, seasons for the particular world, plants and animals that inhabit them, what people would live on/grow/hunt in times before asparagus was flown in from Chile, etc. Making maps was almost one of the most interesting things about beginning a book. I still make them sometimes just because. A doppelgänger is often perceived as a sinister form of bilocation and is regarded by some to be a harbinger of bad luck. In some traditions, a doppelgänger seen by a person’s relative or friend portends illness or danger while seeing one’s own doppelgänger is said to be an omen of death.